I spend a lot of time guiding and teaching photographers who have traveled a great distance to capture a particular shot: Horsetail Fall in February, the spring moonbow on Yosemite Fall, the Milky Way above the Kilauea Caldera, to name a few. They’ve seen an image on my website, or someone else’s, and have decided want to add their version to their portfolio. Many have saved money and vacation time for years for the opportunity; others have been chasing the shot without success more times than they can count. Either way, it’s a vicarious rush watching it happen for them. The captures that make me happiest are the one’s I’ve never seen before. But given that my “job” is guiding people to the scenes I (and others) have photographed many times, I don’t get a lot of opportunity to explore new territory. Instead, I challenge myself to find something new in these heavily photographed areas. And “new” to me is more than just capturing an extraordinary sunset or glorious moonrise, it’s looking beyond the obvious to find a new perspective or fresh interpretation. Finding new scenes can happen by accident, but there’s no substitute for conscious, calculated exploration. For example, a typical day in Yosemite has lots of blue sky and flat light hours that aren’t conducive to the type of photography I enjoy. Rather than waste that lousy light time simply waiting for the good stuff, I spend it collecting new scenes for later use. In Yosemite that usually means deciding on a subject (Half Dome, El Capitan, Yosemite Falls, Bridalveil Fall, and so on) and poking around looking for foregrounds to put with it. 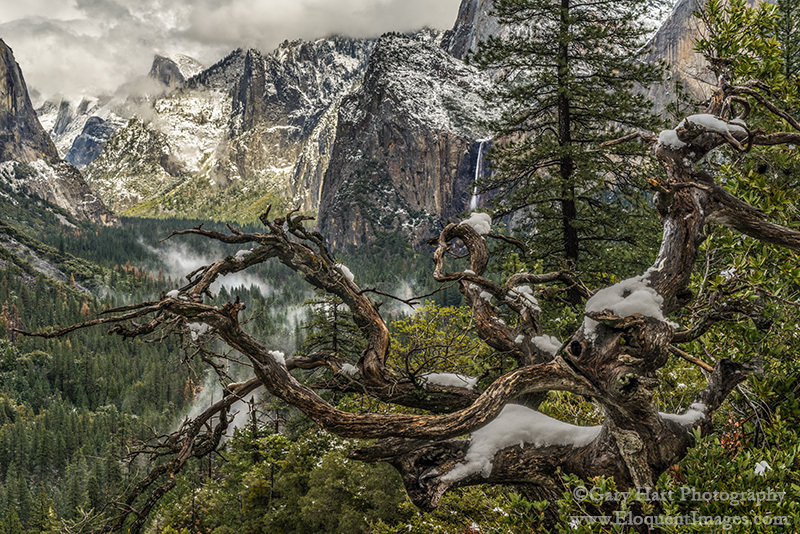 Despite its apparent permanence, Yosemite is a dynamic environment. Rocks cleave and fall, trees grow and die, water ebbs and flows. Whether it’s walking the bank of the Merced River searching for a reflection of Half Dome, or scrambling granite slopes for a fresh view of Yosemite Valley, there are new perspectives and subjects to be mined everywhere. When I find something I like, I try to figure out the conditions that would make the best photography. Sometimes this is simply a matter of plotting a moonrise or moonset; other times the best photography requires very specific weather or light. Whatever the condition might be, I do my best to get myself there to photograph it. Though I photographed this scene just a couple of weeks ago, the view I found on one of these reconnaissance missions several years ago. The first time I saw the twisted remains of this old tree, I imagined it etched with snow. Unfortunately the tree’s location—perched on a ledge above a vertical drop of several hundred feet, is not for the faint of heart, even in the most benign conditions. And getting out here in snow can be downright dangerous. On my most recent Yosemite trip earlier this month (sandwiched between my Yosemite moonbow workshop and a week-and-half in the Columbia River Gorge), my desire for something new trumped my “respect” for heights. I took a long way around to avoid the cliff as much as possible, then did my best not to look down once I arrived. As I worked, every shift of foot or tripod was planned and tested before execution. I tried a variety of compositions, wide and tight, vertical and horizontal, that included some or all of the Tunnel View trio: El Capitan, Half Dome, and Bridalveil Fall. Exposure was pretty straightforward, but depth of field was a concern. I stopped down to f16, but chose not to go any smaller due to diffraction (light bending around small apertures to fill the entire sensor can inhibit resolution) concerns. As always in these scenes where I might not be able to achieve complete front-to-back sharpness, I biased my sharpness to my foreground—rather than focusing on Half Dome, I focused on a branch toward the back of the tree. I actually returned to this scene the next morning, when the snow was much thicker and the light much more difficult. I haven’t had a chance to work with those images, so stay tuned…. Thank you for the information. As soon as I saw this pic I wondered what you had decided to be your focal point since this is something I am working on. I love old trees and my eyes are immediately drawn to them no matter where I am. I love the pic of this one and the beauty you captured with it. It’s my pleasure, Donna—thanks for reading. Hey Gary, how many shots did you take in total on this shoot, and were they all with the Sony A7R? A good collection indeed. Thanks, Andrew. I was in the CRG for a total of 11 days. I took not quite 800 images, most with my a7R but a few with my a6000. My a7S stayed in the bag (no night photography on this trip).